About 5 years ago I decided to build out my own woodworking shop in the basement, my father in law had a paint workshop and when he passed away I decided to use the space for a woodworking shop. There were a decent amount of tools in the shop for painting but he had a few woodworking hand tools that looked in bad shape most of them were hand planes and old ones at that, I always said that I must restore them as I thought they would come out good looking and would actually be very function-able hand planes, but alas I never did until last week when I looked around my shop and realized at how many power tools that I had but had very few hand tools, sure I had a few chisels and marking tools, but I didn’t have any planes or various saws so I decided that in the coming months since I don’t have any major projects that I would start building out my hand tools and eventually make a nice hand tool cabinet. 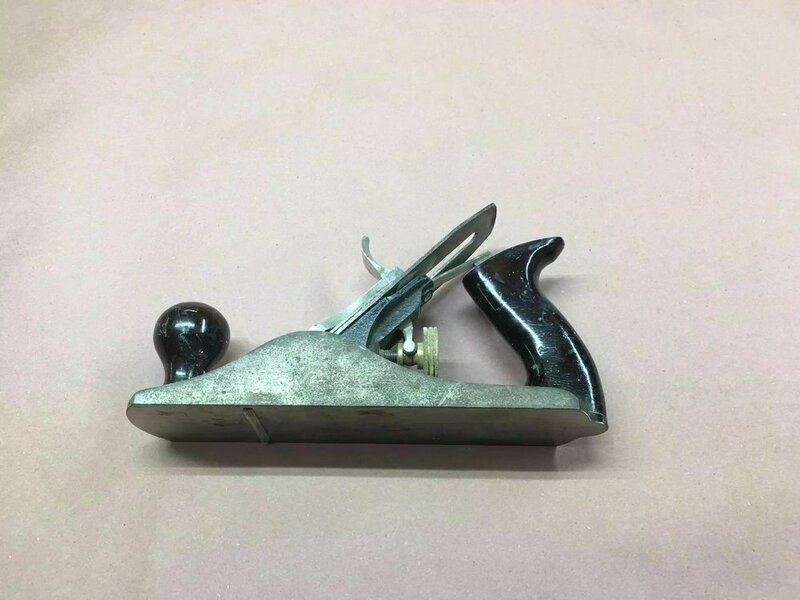 My first order of business was to do research on how to actually restore a plane as I never did it before, so I read woodworking articles, borrowed library books and watched countless You Tube videos before I undertook this process. There are so many resources available on the internet on how to do this but I used various tips from different people on the Internet to aid me in this project. Below are some links and YouTube videos that I though would help. Jays uses regular household vinegar to aid in the rust removal process, he also shows you how to make the tote or rear handle (as his was broken). He also used various grits off sand paper to clean and sharpen the plane. Rex goes through the entire process of restoring a hand plane using only a bench grinder, this video is awesome and it actually made me get one because this machine is extremely useful in a wood shop. I went to my local home center to pick up some supplies before I started the restoration project, some or most of these items you might already have in your house. 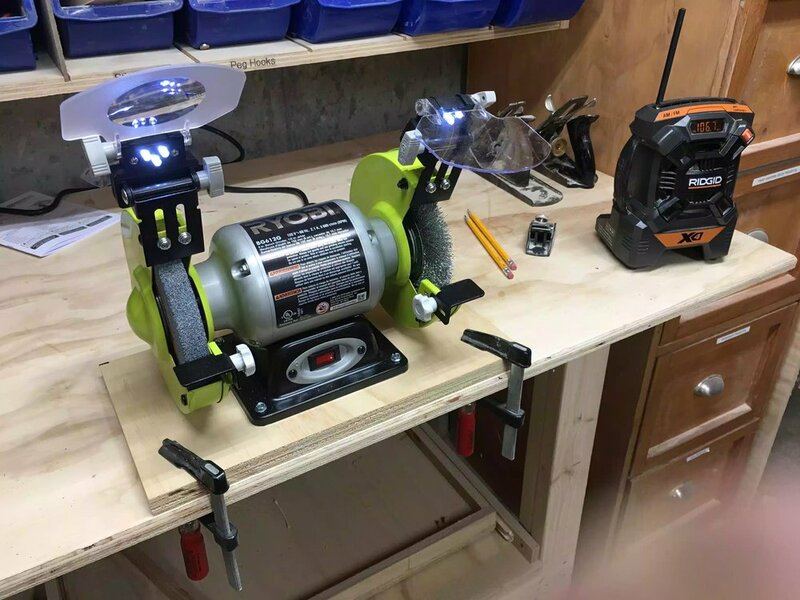 I also purchased a Ryobi bench grinder as I have been wanting one for some time and this was the perfect time to get it as I will be using it in the restoration process. Before I dived into actually starting the hand plane restoration I needed to unpack the grinder form the box and needed to do a small bit of assembly. When I turned the grinder on for the first time It was moving all over the bench so I decided to mount it to a platform that way I could clamp it to my bench and also use it so I could remove the grinder into a shelf when I wasn’t using it. So all I did was cut a scrap piece of plywood big enough to support the grinder by using screws and also large enough to add clamps to either side of the grinder so as that it enabled me to clamp it to my bench. As part of my assembly I purchased a wire brush for the grinder so as that I could use it to remove rust from the plane, I also purchased a buffing wheel for all the brass screws, to use when I was giving it a final cleaning. Grinder all set up and ready for use. You can see the wire brush on the right side of the grinder. I got to admit for $45 this grinder is impressive and up-to most tasks that I would ever need it for. You can see the plywood base that I added , this makes it super portable and I can put it on a shelf when not in use. The plane on its side, here you can see most of the rusting is on the dies of the plane bed. All that was left was to submerge all the plane parts in a white vinegar bath, I will be leaving this over night. The plane isn’t in that bad a condition and this duration is overkill but I couldn’t get back to it today so it should be nice and ready for tomorrow. Here are all the parts soaking in the vinegar solution. That’s all I have time for today…hopefully tomorrow I can start cleaning the parts and start sharpening the plane… with a bit of luck by the end of tomorrow I should have a nice new sharp plane.. that doesn’t look to bad either.